We want to load our little darlings with compelling comprehensible input and what’s more compelling that food?! Not much! It was really fun to chat with my Spanish 1s about Thanksgiving foods this week. We focused on the structures Eats, Likes, Loves and Is going to eat. I made this little Thanksgiving Slide Show and we had a jolly good time! Feel free to make changes, like if for example you say to yourself ¡¿Qué?! Those are not called ejotes, everyone knows they’re judías verdes! Come on, Señora Chase. All you have to do is click “Make a copy” and edit however you want! Because really, at the end of the day I don’t expect them to acquire the word “Green Beans”, I just want to get more mileage out of high frequency structures, give them a chance to express opinions, and bond over talking about food. (If you happen to change the language into something other than Spanish, share it with me! I’d love to include it here!) Grazie to Joyceanna D’Alessandro, here’s the Italian Version! And Merci to Shari Belanger, here’s the French Version! A Picture Talk is just another way to give comprehensible input…Choose a picture you want to talk about…then talk about it in slow, comprehensible language. Ask questions. Elicit their opinions. Since my Spanish 1s are kinda squirrley I incorporated some Muévete si…(Move if) to give them a chance to move around. We have class on Monday and Tuesday before Thanksgiving (Who else does too!?) 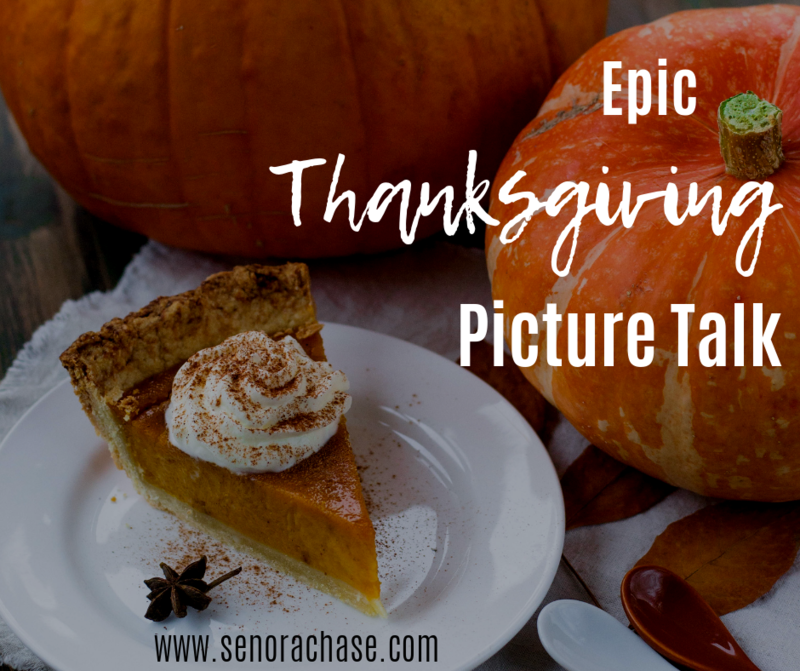 and I’m looking forward to Movie Talking Thanksgiving Showdown:Turkey vs. Farmer, that Señorita Spanish shared on her blog. Wishing you all a Blessed Thanksgiving! May your turkey be delicious and your leftovers plentiful! Muchas gracias! Moving toward more input like this is a year-long goal for me so having something already prepped takes the stress of a “new adventure in Spanish” away – and saves me a boatload of time! ¡Qué tengas un buen Día de Acción de Gracias! Such a great visual! Is “pay” really a word for “pie”? Is “pastel” used more for “cake”? Gracias! Yes, in Mexico they say Pay!! I love it! Thanks for sharing the link- I’ll add it to the post!